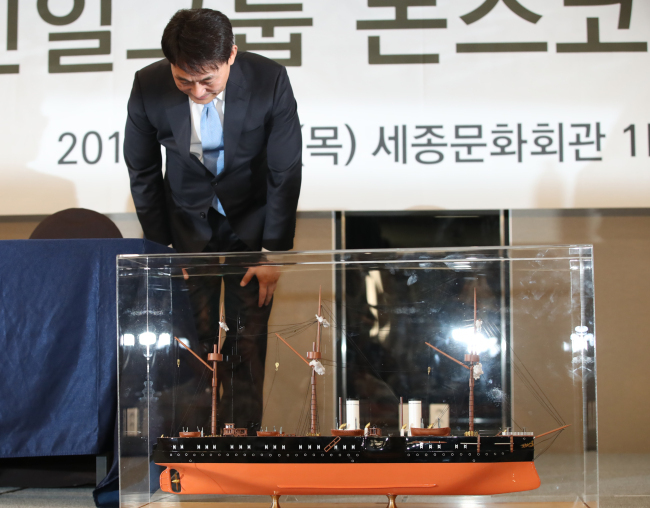 Before it backtracked, the claim of a South Korean company that it had discovered a “treasure battleship” in South Korean territorial waters was a ray of hope for digital asset investors in search of a financial bonanza. But the hope quickly diminished for investors holding what is thought to be a digital asset called Shinil Gold Coin, after a recent press conference by the Korean business entity. 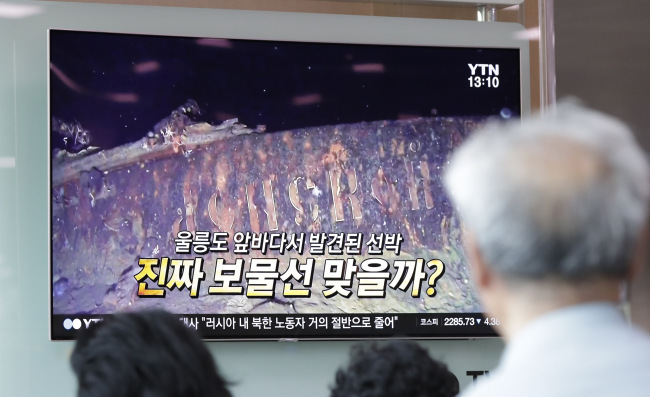 On July 26, officials of Seoul-based Shinil Group, declaring that it had changed its name into Shinil Marine Technology, said they had failed to identify tangible treasures like gold bars or coins inside the alleged Russian battleship Dmitrii Donskoi that was scuttled in 1905. They also withdrew claims the hull underwater contained some 150 trillion won ($134 billion) in gold. This came after Shinil was estimated to have raised funds worth almost 60 billion won as of July 26 on the claim. Shinil Group declared on July 17 that they had found the wrecked ship in June. Officials also claimed they were not connected to Singapore-based Shinil Group PTE, which conducted cryptocurrency presales to some 124,000 investors. According to Shinil Group PTE’s initial blueprint, the value of a coin was expected to rise to 10,000 won compared to a presale price of 30-50 won, once it completed an initial coin offering on cryptocurrency exchanges. 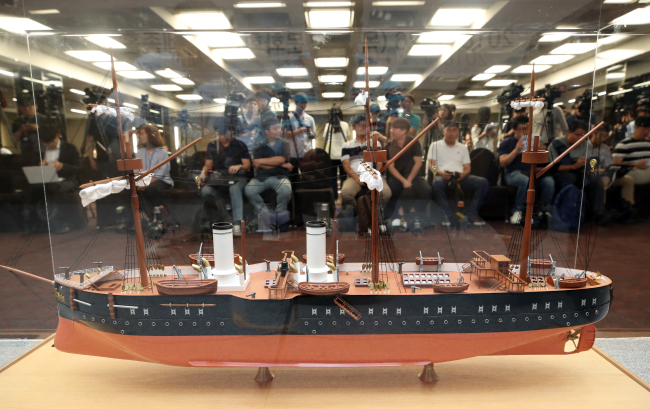 Instead, they argued that Shinil Marine Technology had worked with the “pure intention” to salvage the ship and produce a documentary film. But the Korean Shinil company, whose official name has reportedly gone through numerous changes in the past, continued to confuse potential investors by still promoting the cryptocurrency business on its website. Immediately upon the latest development, police launched an investigation into fraud suspicions regarding Shinil Marine Technology, while officials including Choi Yong-seok, a former chief executive who resigned a week after taking the post, have had travel bans imposed on them. Also on Wednesday, police said they had requested Interpol’s assistance with Ryu Seung-jin, another former CEO of Korean Shinil Group who is alleged to have masterminded the fundraising. Some investors in digital coins have demanded a refund from the investment in the form of cash, only to face constant delays. While the actual number of investors remains unconfirmed, they are expected to face an uphill battle as they struggle to unite and take legal recourse. It seems unlikely they will be reimbursed for their investment even if the people behind the scheme face legal consequences. A 58-year-old man, surnamed Kim, was formerly a realtor and real estate consultant, until he looked to cryptocurrency as a way out of his financial pinch due to a botched real estate project. Upon recommendation of an acquaintance in February, Kim said he not only invested some 5 million won in the scheme, but also invited some of his friends to invest. Kim is considered one of some 150 intermediaries in the quasi-pyramid scheme, although he claims he was not compensated for bringing new investors. He demanded a refund immediately after the July press conference, but was told to wait for 25 days. It was only in July that Kim began to doubt Shinil, particularly when no executives of Shinil Group showed up at the opening ceremony of the headquarters on July 10. But Kim said investors still remain divided as some of them hang on to the belief that the treasure ship claim and ICO plan will turn out as they had originally expected. Another batch of investors into Shinil Gold Coins is made up of former stakeholders of JNU Global, a closed-circuit camera part maker. The company was removed from the second-tier Kosdaq in May 2016 following a hostile acquisition four months before. The stock price of JNU Global plummeted by 97.6 percent in four months until its last trading day. Some 170 shareholders of JNU Global were allegedly personally contacted by Kim Yong-han, who claimed to be a chief of Shinil Utovil Construction, to make investments into his firm. Shinil Utovil had proclaimed its plans to get approval for listing on third-tier stock market Konex, as well as acquire companies in Korea. The engineering firm claimed in 2016 that it had succeeded Shinil Engineering, which went broke in 2012. No such pledges by the firm has come to fruition, while authorities are investigating the identity of Kim Young-han. Shinil officials in the July press conference denied any connection with Shinil Utovil Construction. A 37-year-old JNU Global shareholder, also surnamed Kim, came upon Shinil as he was seeking to recover his 40 million won in stocks in JNU Global. “(Shinil Utovil) approached us over the mobile messenger that (out investment) will save us and keep JNU Global afloat,” Kim told The Korea Herald. Kim is also one of 60 JNU Global shareholders who joined the Shinil Utovil capital increase and had their stock certificates exchanged with the corresponding amount of Shinil Gold Coin. Kim additionally poured in 88 million won to buy coins at the presale stage in May. Kim claims that what he was given were bogus stock certificates, and said he had submitted evidence to police. Kim suspected that Ryu of Shinil Group, who was allegedly disguised as former head of Shinil Group Yoo Ji-beom, might have also acted as the head of Shinil Utovil. Korea has not been an exception from financial scams involving fundraising without a license, but has historically been lenient toward scammers in court rulings. Moreover, Shinil’s fundraising via a presumed cryptocurrency is unlikely to be deemed illegal fundraising despite involving promises of high returns, according to financial authorities here. Hong Sung-jun, secretary-general at Korean activist group Vampire Capital Hunter, pointed to the country’s legal framework that is not as delicate as in other nations, so that punitive actions are not properly taken against financial criminal acts. Moreover, he said victims are left high and dry in getting compensated for financial losses from scams. “In Korea, a fraud victim has to prove that they had been defrauded, which makes it harder for victims to win a criminal suit (against scammers),” he said, stressing the need for victims to form a group for the sake of a collective voice or action. To prevent such cases, financial authorities have urged investors to be prudent in any investment and underscored the responsibility of investors to prevent similar scams.